Increased Performance  data is striped across five independent parallel array channels. Data transfer rate, as well as search speed, is increased by as much as four times the speed of a single tape drive. Increase Data Availability  parity information stored on a parity drive is used to recover data if a tape containing data cannot be read. Read and write operations continue in the event of a drive or media failure. Data Reconstruction  recreates data previously written to a failed drive or bad media. Data Scrambling  a high speed programmable switch matrix allows the insertion of the "stripe set tape cartridges" in any order for ease of tape management. Graphical User Interface  the GUI (Optional) incorporates full, on-line and off-line controller configuration and diagnostics under Wind95 and NT operating systems..
Plug Compatibility  The tape array controller is presented to the host as a single SCSI tape drive providing "plug and play" with host systems supporting SCSI-1 and SCSI-2 tape protocols. Data Striping  across 2 or 4 drives with or without an additional parity drive. Data transfer rate is increased by a factor of two or four respectively. Mirroring  simplifies Disaster Recovery Plans by writing the "data" to up to five separate drives simultaneously. Pass-thru  allows direct accessing of individual drives within the array. Offline Copy, Copy/Verify and Verification Only  provides high speed media duplication and verification operations initiated from the GUI or front panel without host system intervention. Offline Diagnostics  performs drive read and write tests initiated from the GUI or front panel. Low Voltage Differential (LVD/SE) Interface - The host interface provides connection between the array controller and the SCSI host system. It conforms to the SCSI-3 protocol while maintaining compatibility with SCSI-1 and SCSI-2, 8/16 bit SCSI. Fast ULTRA synchronous transfers combined with wide transfers allows for a maximum of 40 MB/sec sustained data transfer rate. Low Voltage Differential (LVD/SE) Interface - The array interface provides interconnection between the array controller and SCSI tape drives. 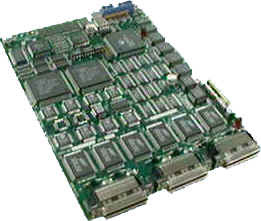 It consists of five independent parallel wide SCSI channels, up to four channels are used for data and 1 channel is optionally used for parity, 8/16 bit SCSI. The fast synchronous transfers combined with wide transfers allows for a maximum of 20 MB/sec sustained data transfer rate. Compatible with all SCSI-1, SCSI-2 and SCSI-3 tape drives including 4mm, 8mm, VHS, Reel/Reel, 3480, AIT, DLT, SDLT, LTO and IBM 3480/3490/3590.